Alzheimer’s disease: hearing that diagnosis for a senior loved one can be life-changing for both the senior and his or her family. While the disease progresses uniquely for each individual, there are some commonalities, such as behavioral issues, that are difficult to manage and can cause family members an unprecedented level of stress. Seek out resources. Your local Alzheimer’s Association is a great resource for family’s struggling through the disease. Local senior centers, online and in-person support groups, family and friends can also help provide a network of support. Set aside time for self-care. The best way to care for others is to make sure you’re caring for yourself. Taking time to exercise, engage in relaxing and enjoyable activities, and get plenty of sleep will help restore the patience and compassion needed to care for your loved one. Partner with an expert. Finding a professional senior care company that specializes in Alzheimer’s and dementia care can help by providing safe, reliable respite care, including during the overnight hours, which can be especially difficult. It’s important to keep in mind that no one can do it all alone. 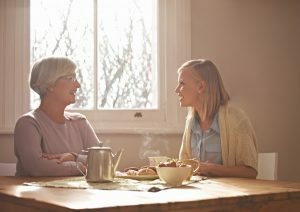 Guilt and other emotions may come into play that make it difficult to accept assistance, but for both the senior’s and your own wellbeing, reaching out to others can make all the difference in the world. For more resources and for trusted, expert Alzheimer’s disease care, provided right in the comfort of your loved one’s home, or in one of adult day health centers or personal care home, contact Georgia’s top rated senior care team, Innovative Senior Solutions, at 866-928-3670. Whether it’s just a few hours a day of respite care, or full-time, around-the-clock dementia care, we’re the home care Cordele GA agency here with the individualized care to enhance quality of life for your senior loved one – whenever you need us.